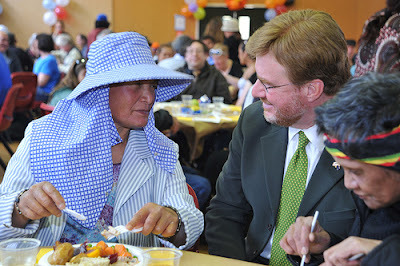 From US Embassy New Zealand: A traditional American Thanksgiving lunch was held at the Wesley Church Hall on November 24, 2010. The lunch a joint effort, with the U.S. Embassy, Downtown Community Ministry and the Wellington Branch of the New Zealand Chef’s Association working together to feed nearly 200 people. From BlogOm: Pancakes: "The Road Show started in earnest outside the Umeå Folkets Hus early Thursday morning. We unrolled the red awning of the classic Airstream Bambi trailer that was still hooked up to our Chevy Avalanche FlexFuel pickup truck, and then set up some tables to begin the American pancake breakfast. 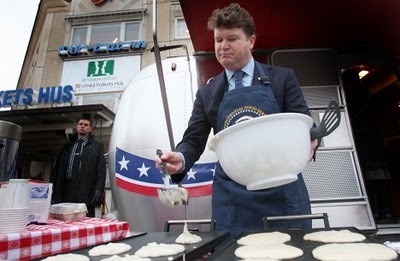 The plan was for me to cook pancakes outside for our host committee, members of the press and the local police, for Bengt from Campia.se who lent us the Airstream (his company imports them from the U.S.), and for curious passers-by who dared to see what we were up to." Click here to read more and see the video. "Last week, some Pakistani friends welcomed me to their homes for Eidul Azha. As someone living far away from loved ones, it was wonderful to enjoy their hospitality and witness the warmth of family and food during this special time in Pakistan. It reminded me of our American Thanksgiving holiday, which is celebrated on the fourth Thursday of November. This year, the Thanksgiving and Eid traditions of charity and sharing are more important than ever here. The severe flooding this summer was the largest natural disaster that Pakistan has ever experienced, and I am proud to say that the American people contributed over one-third of the total relief provided by the international community to help people whose livelihoods and homes had been destroyed. Today, Thanksgiving Day, I take time to reflect on my blessings, including the warm Eid hospitality so recently offered by Pakistani friends. Inshallah, I hope that the spirit of generosity and support from our “two Eids”, both American and Pakistani, can continue through the holiday season and into coming new year. 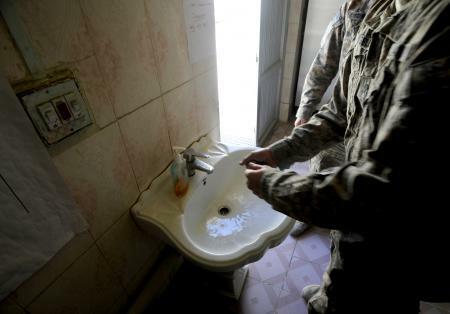 Airmen and soldiers use a single sink to wash their hands as they arrive for Thanksgiving dinner on Forward Operating Base Smart, Zabul province, Afghanistan, Nov. 25. More than 200 soldiers, airmen and civilians are stationed here. Chargé d'Affaires Doug Silliman, Catherine Silliman and their two sons opened their door to Turkish television channel “Kanal D” for a traditional American Thanksgiving, demonstrating family recipes for such American classics as peppered corn bread, Indian pudding and – of course – stuffing for the turkey. While the Silliman parents cooked, the Silliman sons played piano and romped with the family dog in an effort to show typical family pursuits on Thanksgiving. Recipes: Massachusetts Best Indian Pudding, Texas Hot Pepper Corn Bread and the Silliman Apricot and Walnut Stuffing.